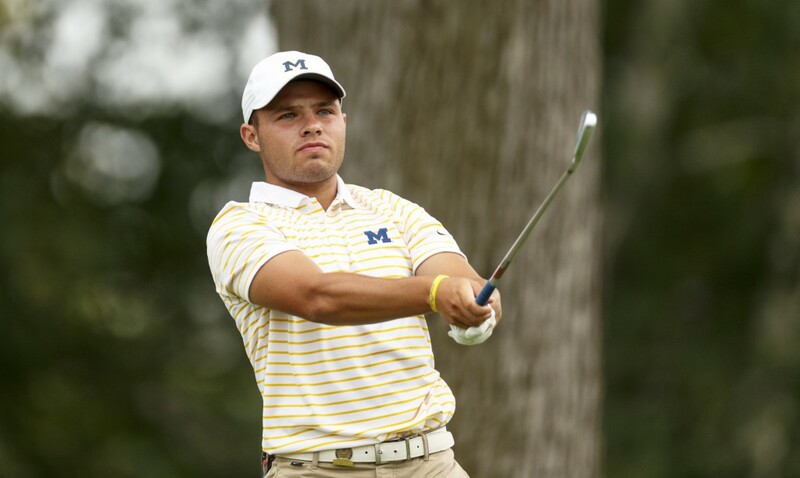 University of Michigan sophomore Nick Carlson advances to the US Amateur quarterfinals. Carlson, a native of Hamilton, Michigan, has said several times this week that his only goal was to qualify for match play. He has done so much more than that. On Wednesday’s round of 64, Carlson dispatched Zach Fourshee of Oregon 2 and 1. In the round of 32 on Thursday morning (August 18), Carlson defeated the number six ranked amateur, Scott Gregory of England after 19 holes. That (this) afternoon, Carlson defeated KK Limbhasut, the world number 43 ranked amateur in ninteen holes. Carlson, for what it’s worth, is ranked 1, 981. Over 55 holes of match play this week, Carlson has trailed on just four holes — all of them in the round of sixteen against Limbhasut. A long hitter, Carlson has feasted on the par fives. On the par five second, Carlson has gone eagle, birdie, birdie, going 1-Up in each of those rounds as a result. Carlson has shown a bit of daring. Twice today, he played his tee shot on the seventh hole to the adjacent second fairway to take the water out of play, and to gain a better angle to the green. And at eighteen — once with a one shot lead, and once with a one shot deficit — Carlson hit his ball well right to the tenth fairway for a favorable angle. The first time, it didn’t hold his lead. The second, the play arguably allowed him to even the match and take it back to the first hole for his win. As a hometown favorite, Nick’s crowds have likely been the largest of the week. He appreciates the fans, and says he feeds off of them. It was unreal. I can’t even describe it. There’s so many people. I mean, there was so many people on this last hole. I was feeding off them on 18. My caddie told me to slow down and breathe on 1 tee. Luckily enough we did, and I mean, I didn’t really realize how amazing it was to have this big of a crowd until that last putt went in. Just to look out and see people three deep all around the green, it was pretty special. The quarterfinals begin tomorrow at Oakland Hills Country Club at 1: 30 p.m. The first group will be Nick Carlson and Dylan Meyer. Meyer is the number 35 ranked amateur.